Cashew butter buckeyes?! I’m going there. Somehow, I don’t have buckeyes here on the blog. It’s amazing, really, because the first year I was blogging, I’m pretty sure I shared the recipe for every single cookie that my mom and grandma have ever made. I mean, it was ridiculous. But no buckeyes! These have been a staple my entire life, so I obviously had to go and sort of trash them up. Or, ruin them, according to my mom. Ha. Not really. She didn’t say that. But I know she certainly thought it. I am obviously a huge proponent of the chocolate peanut butter movement. I mean is there ANY better combination out there? No. It’s just the best. It’s basically therapy. Delicious edible therapy. From an early age I can remember dipping a piece of chocolate in a peanut butter jar. To this day one of my favorite snack treats (yes a snack treat, just do it) is a peanut butter spoon dipped in chocolate chips. There is something about this combo that makes my brain go crazy. I can’t help it! SO it’s not like I want to change the traditional buckeye. My mom has been making buckeyes since I was… well, born? Before that. I can remember helping her dip buckeyes in our first house and we moved when I was eight, so it was before that. That’s what chocolate + peanut butter does to me! Create lasting memories, I guess. I wanted to do a little update. I adore cashew butter. I’ve made homemade cashew butter, cashew butter cups, cashew butter granola, cashew butter krispy treats – so many things. I knew that when coated in chocolate, these would be fantastic. Cashew butter buckeyes just sounded incredible. And they were! The cashew butter whipped into a dough better than I expected. I used the Justin’s brand because it’s what I had on hand, but I think other brands would work too. When I make buckeyes, I always add some coconut oil into my chocolate to help with the shell. My mom still uses the paraffin wax and that totally freaks me out (even though a simple google tells me that edible paraffin wax is completely fine!) so I’ve found coconut oil to be a great replacement. That’s why you see it here in the recipe. I use it in anything that I coat with chocolate. It helps it set up so nicely. But! Since I know you’ll ask… if you don’t have it, it’s not 100% necessary. While these won’t replace my chocolate + peanut butter love forever, they are such a fun, modern twist. The cashew butter is so creamy and rich. It’s delicious against the chocolate! Might have to hide them all from myself. Probably. 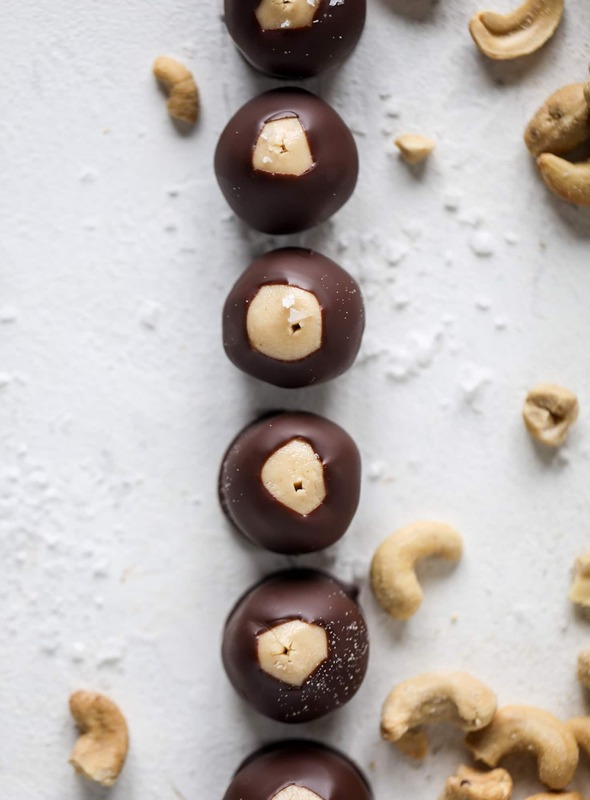 These cashew butter buckeyes are a fun and modern twist on the traditional buckeye recipe! Creamy cashew butter makes a delicious, rich dough and then it's coated in chocolate and sprinkled with sea salt. Delicious! In the bowl of an electric mixer, beat the cashew butter and butter until creamy and combined. Beat in the vanilla extract. With the mixer on low speed, beat in the powdered sugar. This may take a while to come together and you might even have to use your hands. Once the dough has come together, roll 1-inch balls and place them on a parchment paper lined baking sheet. Place the sheet in the freezer for 30 to 60 minutes. Melt the chopped chocolate and coconut oil in a large bowl. I just do this in the microwave - I melt in 30 seconds increments on 50% power, stirring after each increment until smooth. Use a toothpick or some sort of skewer, dip each cashew butter ball in the chocolate and place it back on the parchment paper. Sprinkle with the flaked salt. These stay fantastic in the fridge and the freezer! I store mine in the fridge, but they are fine at room temperature for a few days too! OMG love this cashew twist on Buckeyes – my Ohio pride side is proud of you for this creation. I have never heard of a Buckeye. I guess that’s my east coast upbringing. How about some Clam cakes and Clam chowder….yum. My Ohio self is excited to try this twist on a staple! What an ideal recipe for the holidays to come ! Thank you ! omg. these are the best! I have cashew butter waiting to be used for this!! Yay!!! Also, your recipe instructions do not mention when to add the coconut oil. Based on reading the whole post, I know it goes in with the melted chocolate, but just something to be aware of! Thanks for sharing this recipe! Yay!! My 4 year old is allergic to peanuts (boo) so I’m definitely making these ASAP! What about almond butter?! Would it turn out as firm or would I need to add more sugar (oh no) to thicken/stiffen it? Thank you! I was planning on making these for a baby shower! Love the cashew twist. How long do you think they would keep in the freezer? Do you recommended waiting to dip them in chocolate or freeze with chocolate? Thanks! And here I thought I was the only one who ate a spoon of peanut butter with chocolate chips on top! 😉 My total guilty pleasure. Also, I love cashew butter. My favorite is from Bliss Nut Butters, but it’s so expensive (and I have to order it online!) that it’s a special treat, and I only eat it off the spoon. Just made these to watch the big 10 championship football game (Go Bucks!). They are quite yummy & I’m hoping they’ll be a hit at the party we’re attending! Next time I make them I think I’ll use only 4-5 cups of powdered sugar & maybe half peanut butter & half cashew butter! They taste very sugary and not very nut-buttery. I’m a die hard peanut butter fan & also do the whole spoon of PB in the choco chips trick 😂 The coconut oil was perfect to help with chocolate shell! Overall very yummy & easy to follow recipe! Thank you! Ok these look amazing. Question on the coconut oil. Can you taste the coconut? Or does it just help set the chocolate? Thank you for keeping me entertained. Happy Holidays. while these look incredible, the OG buckeyes are my absolute, forever and ever, hands down, FAVORITE cookie of all time. my aunt makes them every year and i actually think about them like the entire month of december. they are THE BEST. aaah you can tell where my mind is. buckeyes forever!